Surgery (microsurgery), is physical intervention of the body for a treatment. Like any other form of treatment, it is not without risk. 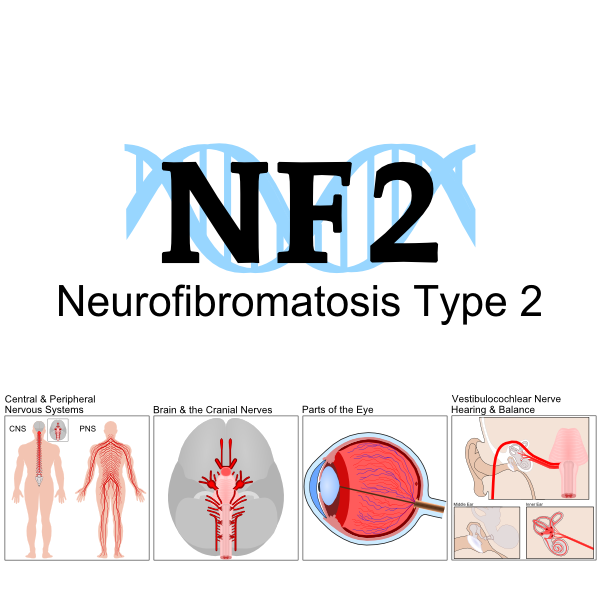 Surgery is currently the ideal treatment for schwannoma and meningioma tumors for people with neurofibromatosis type 2 (NF2). 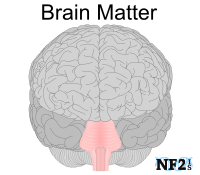 While NF2 tumors are slow growing, it can allow the brain and body to have time to try to adapt and adjust which can allow a tumor to grow to a considerable size before treatment might be necessary. Continuous growth of any tumor or tumors can result in a serious health issue. The requirement of surgical intervention dependent on tumor size, location and how bad the side effects are or can become if a tumor increases any further. 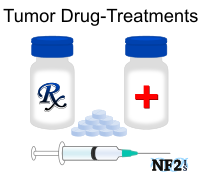 Individuals with NF2 can develop two but up to hundreds of tumors, but not every tumor that grows will require treatment. 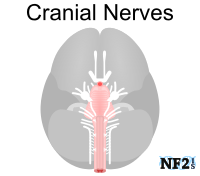 If a NF2 schwannoma tumors are benign (noncancerous) tumors, and tumor growth results in loss of function of the nerve, why might surgery be necessary? intracranial pressure, block of fluid needed to filter the brain, and help blood flow to nerves, veins, and arteries. 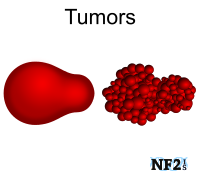 If NF2 meningioma tumors are benign (noncancerous) tumors, and tumor only grow as isolated masses, why might surgery be necessary? 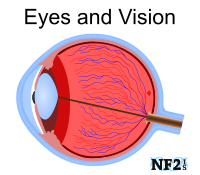 Decompression (resection/excision), is currently the most effective means of tumor management for NF2 at this time. 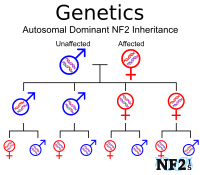 However, since this only helps one tumor at a time and individuals with NF2 tend to have a vast number of tumors, a better treatment is needed. Excision, complete removal is the ideal option when possible. It guarantees the tumor would not need to be dealt with again to cause future complications unless it for some reason grows back. Debulked: Removal of part of a tumor, partial (or subtotal) removing some of the bulk of a tumor mass. 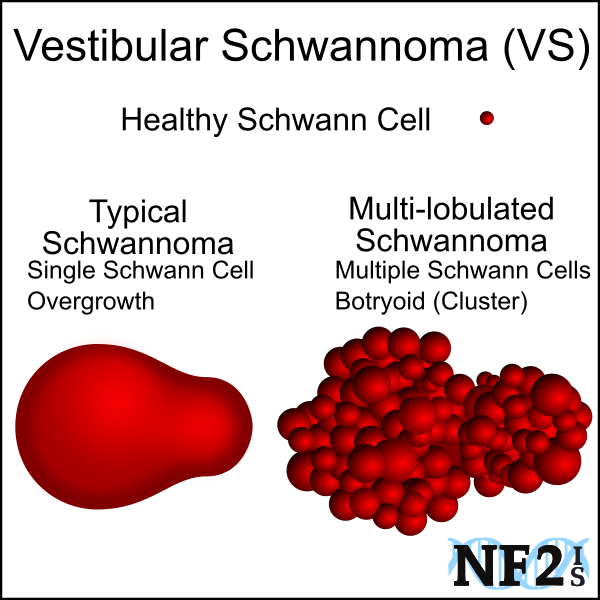 There are different types of tumors, but schwannoma tumors grow as a part of the nerve, and complete removal of these tumors can cause damage to additional nerves. If a tumor is large enough, partial removal can relieve pressure of the immediate health issue. However, this typically results is tumor regrowth and there is no way to know at what rate before more issues arise to require additional surgery later. In an attempt for the body to heal, each surgery will result in glial scars. This buildup of damaged cells in the brain can eventually result in seizures. Craniotomy: When bone from the skull is removed from to access the the brain for surgical management. Endoscopic Surgery: Some areas in the brain that located in inoperable locations with craniotomy are accessable through the either sinuses or eye. These methods of tumor removal can be used to decrease operation time, are minimally invasive approaches, and result in safer surgeries. Endoscopic Endonasal Surgery is the removal of a tumor through the sinuses and the transorbital neuroendoscopic surgery (TONES) approach), is surgery through the eye. With the suboccipital approach (retrosigmoid approach/keyhole approach), the surgical entry point to remove a tumor is behind and below the ear. Advantage: chance at saving hearing and facial nerve. Risk: fifty-percent (50%) of hearing loss and high risk of consistent regular headaches. When a vestibular schwannoma (VS) is removed with the translab approach (translabyrinthine), the surgical entry point to remove a tumor is through the ear canal. 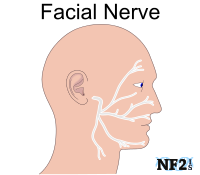 Advantage: the facial nerve has best chance at being saved. Risk: hearing loss and balance problems are guaranteed. 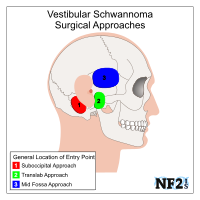 When a vestibular schwannoma (VS) is removed with the mid fossa approach (middle fossa approach/middle cranial fossa approach, the surgical entry point to remove a tumor is over and forward from the ear. Advantage: best chance at saving hearing if the tumor is small. Risk: high risk of damage to the facial nerve and possible risk of problems with speech and memory. Vestibular schwannoma (VS) bone decompression (core decompression) is removal of a bone where the vestibulocochlear nerve (CN8); the cochlear nerve (hearing), and the vestibular nerve (balance/equilibrium ), as well as the facial nerve (CN7); for facial expression, exit the skull. 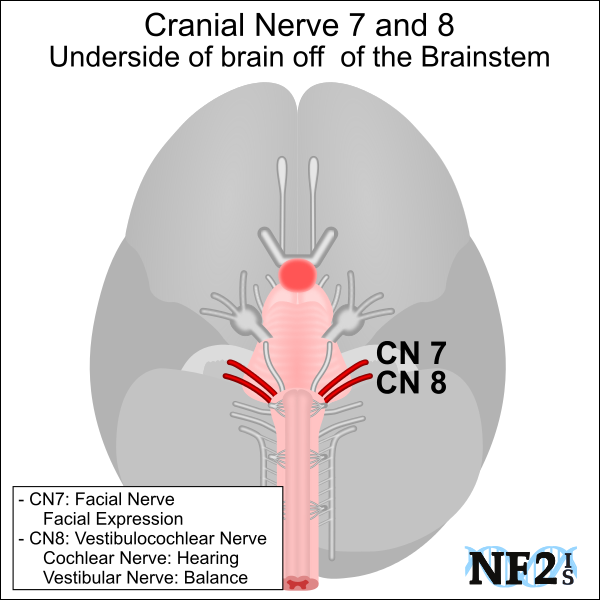 CN7 and CN8 leave the skull at the same point; the middle cranial fossa area of the skull through the internal acoustic meatus bone. Surgical approach to a nerve the tumor grows on can also allow approach for a hearing impant. Surgery for hearing implant, may not require removing the tumor causing damage and could mean minimal risk. There is a better quality of sound with a cochlear implant, but monitoring the cochlear nerve (hearing) during surgery would allow for an auditory brainstem implant (ABI) if this nerve is not strong enough following tumor removal. Surgery later just to implant an ABI at a later point would result in an individual being deaf for months and is otherwise an invasive surgery. If the facial nerve (CN7) might be damaged during surgery, either an mechanical-pressure monitor (EMG) might be used to monitor the nerve strength. If the Facial Nerve loses connectivity during surgery, a nerve graft might be done when the nerve is being damaged, or later in facial reanimation surgery as well as the possibility of a free muscle transplant. Olson, Jeffrey J., Steven N. Kalkanis, and Timothy C. Ryken. "Congress of neurological surgeons systematic review and evidence-based guidelines on the treatment of adults with vestibular schwannomas: executive summary." Neurosurgery 82.2 (2017): 129-134. Zanoletti, E., Martini, A., Emanuelli, E., & Mazzoni, A. (2012). "Lateral approaches to the skull base." Acta Otorhinolaryngologica Italica, 32(5), 281. Brackmann, D. E., Cullen, R. D., & Fisher, L. M. (2007). "Facial nerve function after translabyrinthine vestibular schwannoma surgery." Otolaryngology, Head and Neck Surgery, 136(5), 773-777. Wang, A. C., Chinn, S. B., Than, K. D., Arts, H. A., Telian, S. A., El-Kashlan, H. K., & Thompson, B. G. "Durability of hearing preservation after microsurgical treatment of vestibular schwannoma using the middle cranial fossa approach: Clinical article." Journal of neurosurgery, 1-8. (2013). Rabelo de Freitas, M., Russo, A., Sequino, G., Piccirillo, E., & Sanna, M. "Analysis of Hearing Preservation and Facial Nerve Function for Patients Undergoing Vestibular Schwannoma Surgery: The Middle Cranial Fossa Approach versus the Retrosigmoid Approach-Personal Experience and Literature Review." Audiology and Neurotology, 17(2), 71-81. (2011). Bedi, Anupama D., Steven A. Toms, and Amir R. Dehdashti. "Use of hemostatic matrix for hemostasis of the cavernous sinus during endoscopic endonasal pituitary and suprasellar tumor surgery." Skull Base 21.3 (2011): 189. Ceylan, Savas, Kenan Koc, and Ihsan Anik. "Extended endoscopic approaches for midline skull-base lesions." Neurosurgical review 32.3 (2009): 309-319. Rivkin, Mark A., Alan R. Turtz, and Kenneth E. Morgenstern. "Trans-orbital endoscopic removal of posterior lateral orbital mass: A technical note." The Laryngoscope (2013).